MAPIT – “Magnetic Particle Imaging Technology” – is a large-scale joint research project dealing with the exploration of Magnetic Particle Imaging. Partners from industry and science collaborate concerning basic research, hardware development and optimization, aiming at preclinical and clinical applications in functional, molecular and interventional imaging, especially cardiac assessment and the image guidance of cardiovascular interventions. One major aspect in the project is the characterization and improvement of superparamagnetic iron oxide nanoparticles, which are used as tracer material in the imaging process. The other focus lies on the instrumentation: three different MPI scanner setups are being developed and implemented, including a hybrid MPI/MRI scanner. 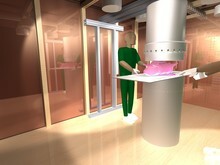 In cooperation with the clinical partners from the Department of Radiology and Nuclear Medicine of the University Hospital of Schleswig-Holstein, Campus Lübeck, the Institute of Medical Engineering is developing an MPI scanner setup, which shall be used for the image guidance of cardiovascular interventions in animals. In addition to coil and scanner design as well as signal generation and processing, research is conducted in the fields of efficient image acquisition and reconstruction, image quality and image artifacts. Further studies cover the visualization of interventional instruments and safety aspects, particularly heating of utilized devices. 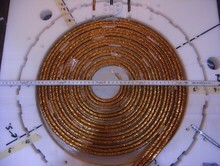 Left: electromagnetic coil for an MPI scanner, right: simulation of an MPI scanner for a mini pig. Stelzner, J., Weber, M. and Buzug, T. M.: A Receive Coil Topology Based on Oppositely Tilted Solenoids for a Predefined Drive Field, In: International Workshop on Magnetic Particle Imaging, 81-82, 2018. Stelzner, J., Bringout, G., Graeser, M. and Buzug, T. M.: Toriodal Variometer for a Magnetic Particle Imaging Device, In: International Workshop on Magnetic Particle Imaging, 92, 2015, DOI: 10.1109/IWMPI.2015.7107074. Bringout, G. and Buzug, T. M.: Coil Design for Magnetic Particle Imaging: Application for a Preclinical Scanner, IEEE Transactions on Magnetics, 51(2), 5100808, 2014, DOI: 10.1109/TMAG.2014.2344917. Stelzner, J., Graeser, M. and Buzug, T. M.: Design and Construction of a Toroidal Filter Coil for a Magnetic Particle Imaging Device, In: Deutsche Gesellschaft für Biomedizinische Technik Jahrestagung, 679--682, 2014, DOI: 10.1515/bmt-2014-4280. Duschka, R., Wojtczyk, H., Panagiotopoulos, N., Haegele, J., Bringout, G., Buzug, T., Barkhausen, J. and Vogt, F.: Safety Measurements for Heating of Instruments for Cardiovascular Interventions in Magnetic Particle Imaging (MPI) - First Experiences, Journal of Healthcare Engineering, 5(1), 79-94, 2014, DOI: 10.1260/2040-2295.5.1.79.